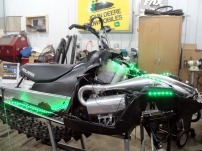 I had a few customers ask for some tips on installing our new Multi Color LED kit on a snowmobile, so here it is. 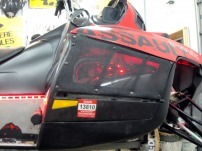 I took pictures of each step to help simplify the process and show some key constraints on a snowmobile. 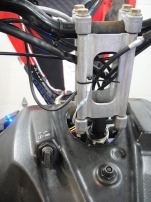 Like, the IR sensor and module are mounted in the very center so the IR eye is on the handlebar riser. That way it can be activated from either side very easily. Also, In the initial steps, I loosely routed all the lights roughly where I wanted them, started to apply the strips where I wanted next, then worked on the interconnect cables to run the circuit. I did make 2 runs from the controller by making a "Y" cable from the supplied cables. This made the routing cleaner and allowed for the strips on the tunnel to terminate on each side. (I clipped off the connector on the strips that were not being used to make the "Y" cable). 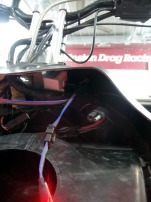 I also ran the loop of lights under the hood and into the shock tower first, then used the long cable to run the power from the shock tower to the tunnel area to light the long LED strips. In all, I spent about 2 hours messing around and getting things where I thought they would look nice. All along the way, I was testing the LEDs to be sure I had a good connection, all lights were working as assemboled, and that the IR eye was picking up the remote control from all angles. You'll also notice the picture of the silicone being applied. As with any sled I put LEDs on in the shop, I put a good dose of clear 100% silicone around the edges of any light that is exposed to the elements. This helps to give a long lasting bond and keeps moisture from getting under the strip and on the 3M adhesive backing. This was a real fun project and looks even better in the dark. Click on the pictures to get larger pictures and scroll thru them to see the lights with the hood closed and from different angles. I had the shocks off to get them serviced, but was not necessary. 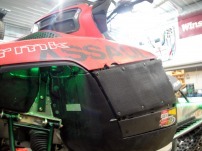 A warm and clean sled is all you need to have a good, long lasting install. 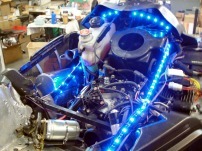 Here the lights are installed and about ready to go! Notice the exhaust side, I wrapped the strip around the support rod. 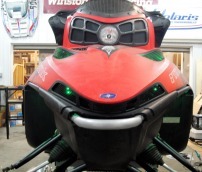 Looking at the front half of the sled w/hood closed. 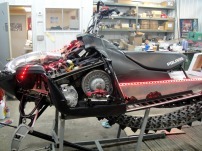 Right side of sled with everything on. Once LEDs are stuck, silicone around the strips that are exposed will add to the life so they don't come loose.